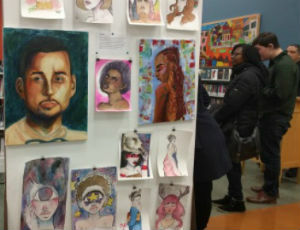 Teen Voices: Featuring Assata M.
If you have visited Harold Washington Library Center's YOUmedia recently, then you know the work of Assata M., which is showcased prominently there. Assata, who was named the second runner-up for the Young Artist's Award in this year's Teen Winter Challenge, often spends time in YOUmedia sketching, painting or talking about art. Assata has continued to work closely with Jeff, a YOUmedia Mentor. On August 28, Assata received a Fifth Star Honor award, presented to only 25 teens in Chicago every year. Assata shared, "I am most proud of the journey I completed, making it up to this point of being a recipient of this amazing award. I am proud to say that I persevered and kept on going with my art [despite] the doubts and opinions of others claiming that I would not get anything out of doing art!" She added, "The event was spectacular and I loved every second of it." Assata believes, "Anything is possible, and that everyone is amazing in their own way with their own talents." At the event, she was able to meet the Rising Star Team and was happy to discover that she knew one of the other winners. She added, "He was a cool individual, and I'm sure we could collaborate and merge artistic visions." Congratulations and may you continue to grow and develop at CPL, Assata!